Saratoga Lake Waterfront - close to Racetrack & Downtown Saratoga! Awe-inspiring views and location - enjoy lake living at its best! This beautiful property is located at the water’s edge. Guests will be renting this 3rd floor condo unit which has amazing views, beautiful finishes and a deck (w/propane grill) overlooking Saratoga Lake! Complimentary WiFi is also available for use. Please note that we recently installed air conditioning to keep you nice and cool during those warm summer evenings. When we originally purchased the property, it did not have AC but it's now readily available for your enjoyment! 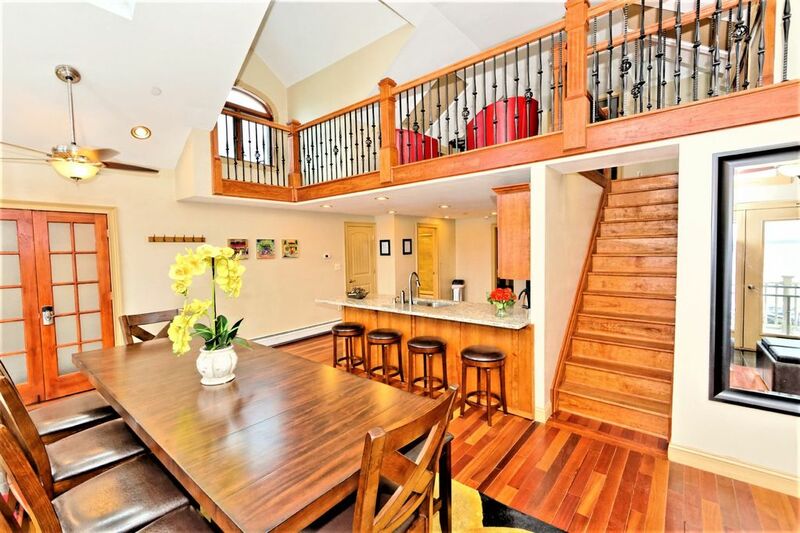 •	Open floor plan that takes advantage of the incredible Saratoga Lake views. The location allows you to enjoy gorgeous sunrises and sunsets. •	The property is less than 20 steps from the water’s edge. Enjoy boating, water skiing, jet skiing, sailing, wind surfing, fishing, diving or simply relaxing and enjoying the views! You’ll have access to the dock (during the boating season) so bring your boat, kayak, canoe, sail boat and fishing poles! Many properties near Saratoga Lake are located so that you have to walk across the road (such as 9P) to enjoy the lake. Check with the property owners before you reserve those properties. Our property is on the lake. •	Easy access to it all…Saratoga Race Course (thoroughbred race track), Saratoga Performing Arts Center, Saratoga Spa State Park, Saratoga National Historical Park, Saratoga Golf Courses, Saratoga's Museums, Spas, Mineral Springs and much more! •	Incredibly rare location - near several restaurants! Brown's Beach is one of the only public swimming spot on Saratoga Lake. This community favorite swimming spot was closed for roughly a decade and recently has been opened to the public again. It has a shallow launch area and is great area for learning any type of water sport. Picnic and volleyball area is available. What better way to experience Saratoga Lake during the summer than to rent a Kayak or paddleboard? The Kayak Shak also offers tours, community barbecues and bird and nature watching. And if this is your first time kayaking, The Kayak Shak will show you the ropes! Saratoga Lake boasts one of the best fishing spots in the region. The Lake is excellent for bass fishing and the deepest section of the lake is 96 feet. The Lake is also stocked with over 8 million walleye. The weed beds framing the shoreline are great for anglers fishing northern pike. Around for the winter? Ice fishing is also permitted - make sure to check out the annual Ice Fishing Derby. If you are an avid golfer, The Saratoga Lake Golf Club is a beautiful resort in the heart of the Adirondacks. Play 18 holes overlooking the peaceful Lake and join an annual tournament. And if you are a part of the new New York Golf Trail, the Saratoga Lake Golf Course has recently been added. •	The Saratoga Lake is home to rural canoe, kayak, and nature trails, snaking through the Kayaderosseras Creek and ending in the Saratoga Lake, giving you access to Fish Creek and Lake Lonely. The trail offers relatively mild paddling in the spring and autumn with several opportunities for whitewater when the river runs high. o	Incredible dining, appetizers, coffee shops and so much more. o	Saratoga Race Course: Also know as Saratoga Racetrack or 'the flat track', Saratoga Race Course is the oldest continually operating Thoroughbred horse racing track in the United States. The track is home to the Travers Stakes, 'America's Mid-Summer Derby' which occurs in late August. o	Saratoga Performing Arts Center: Referred to locals and frequent visitors as 'SPAC', this outdoor performing arts venue features classical performances, the Saratoga Jazz Festival, the Saratoga Wine and Food Festival and major pop and rock concerts. It is the summer home of the New York City Ballet and The Philadelphia Orchestra. o	Saratoga Casino and Raceway: With over 1,000 video gaming machines, harness racing and a night club, Saratoga Casino and Raceway has plenty going on. Just be sure to bring your good luck charms! •	It's time to get away and enjoy the charm! Character, history, and charm are just a few of the reasons Saratoga was named as one of America’s Dozen Distinctive Destinations by the National Trust for Historic Preservation. However, this sort of acclaim is nothing new to Saratoga. For centuries, Saratoga Springs has been a premier destination. Discover all there is to see and do here, from world-famous horse racing at Saratoga Race Course during the summer to award-winning golf. There is so much to do in Saratoga...the perfect place for your next getaway! Lakefront accommodations to enjoy the views and take advantage of the many water activities yet close-in to Saratoga Springs (The Spa City) to enjoy the track, art, culture, parks, shopping, restaurants, Saratoga Performing Arts Center (SPAC) for incredible concerts and venue, Spas and so much more! You are located right next to the waters edge - amazing sunrises and sunsets! Close proximity to downtown Saratoga Springs, The Spa City! Located directly on gorgeous Saratoga Lake! Automatic drip coffee maker. Coffee filters are provided. A variety of spices are available for use. Access your favorite songs using Pandora or other apps. Access your Netflix or similar account and watch your favorite movies! Property overlooks the lake and you'll have a dock available for use for your outdoor enjoyment (based on seasonal conditions)- bring your favorite water sports and have fun on gorgeous Saratoga Lake! Kayak/canoes do not come with the home but you're welcome to bring them and tie them up to the dock. No boat comes with the home but guests are welcome to bring their boats and park them at the dock. Large deck that overlooks Saratoga Lake! Bring all your water gear and enjoy all the lake has to offer - dock available for use! Everything about this rental was amazing. The photos perfectly illustrate the light-filled space and lakefront views. We came here with a group of 9 and everyone had a comfortable sleeping arrangement. Very uber-able location to the variety of attractions in Saratoga. We came before the warm weather arrived and had a blast. I can only imagine how great this would be in the summer months. This was a perfect weekend getaway - we wished we could stay longer! Nick and Lynn were incredibly accommodating and nice. The condo had everything we needed and then some. Also beautiful view and a quick ride downtown to fun bars and restaurants. I would definitely stay here again. Thanks for a wonderful New Year's! This was our family's first visit to Saratoga Springs, and we absolutely loved it. We were there attending a wedding so unfortunately did not have the opportunity to see as much of the area as we would have liked, but were able to take in some great meals at local restaurants. The house worked out great for us, with beautiful views of Saratoga Lake. The house was very clean, and the kitchen was well stocked with all the basics like spices, coffee filters, etc. Rick, the property manager, was very helpful. We would definitely rent this home again. Warm and cozy, we had a perfect girls fall weekend. The view is outstanding and we were a short Uber ride to downtown. Very comfortable and we all enjoyed ourselves. Our group had a blast at this beautiful lakefront property. The well-stocked kitchen made cooking our own meals so much easier, and we loved the time spent on the deck. With lots of sleeping space, an on-site laundry, and lots of extra linens, everything was made easy for us. We loved our visit and would definitely come back! Enjoy all that Saratoga Lake has to offer in this lakefront property and walk to nearby several restaurants nearby. Saratoga Springs (the spa city) is just a short drive away along with the world-renowned thoroughbred race track, golfing, racino, spas and so much more! This property is truly lakefront and literally 20 feet from the water’s edge and has a new long dock available for guest’s use so bring your boat, canoe, kayak, jet ski or rent from the adjacent marina or simply enjoy being on the water. Before booking other “lakefront properties” ask the owner if you need to cross a road to get the the lake. Many properties will advertise "lake frontage" but have a road (commonly 9P) in front of them so you have to cross the road to access the lake.